Banbury's teens are being offered a range of free cutting-edge cyber security courses by the National Cyber Security Centre (NCSC). The CyberFirst courses, which will take place in London this summer, will be delivered by QA and coordinated by the UK’s largest STEM education charity, The Smallpeice Trust. They are designed to provide teens aged between 14 and 17 with practical experience of how everyday technology works and how to take sensible steps to protect the digital world. Other CyberFirst course activities will include how to spot a cyber threat, constructing a secure network, and using open source intelligence techniques, while the teens will also get the chance to improve their key skills such as teamwork and leadership. The five-day residential courses, which take place in July and August, also offer the chance for teens to experience university campus living. Dr Kevin P. Stenson, chief executive of The Smallpeice Trust, said: “The exponential popularity growth of mobile devices and the increasing rate in which everyone relies, in one way or another, on internet-enabled systems is changing the face of the UK workforce. “The cyber security sector is set to be one of the fastest growing in the coming years, and it will rely on people from all backgrounds and abilities to contribute to finding the solutions to our cyber challenges. Last year, the courses attracted more than 3,000 young people across the UK. CyberFirst was launched in 2016, led by the NCSC, part of GCHQ, as a programme of opportunities to help young people explore the world of cyber security. This has developed into an initiative training tomorrow’s cyber security community, made up of people from a range of backgrounds who can learn the skills to safeguard their own digital worlds, at home and at work. Chris Ensor, NCSC deputy director for cyber skills and growth, said: “CyberFirst is a bold and innovative programme aimed at supporting and developing the UK’s cyber security talent and helping to address the cyber skills gap. “Millennials are arguably the most naturally adept at using technology. Most have used web-enabled devices from a very early age and have an instinctive understanding of how to use them but not necessarily how they work and how to protect them. • CyberFirst Defenders - An introduction for 14 and 15-year-olds on how to build and protect small networks and personal devices, how to define and apply first-line cyber defences, and steps that can be taken to manage personal digital footprints. 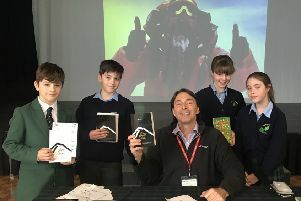 • CyberFirst Futures - Will teach teens aged 15 and 16 about advanced cyber security threats to devices, apps and software, then discover ways to prevent them. This course involves learning how to secure personal devices, and how to do it for businesses in the future. • CyberFirst Advanced - Open to students aged 16 and 17. It includes lessons on implementing digital forensics, understanding the latest encryption technologies, using open source intelligence techniques, and the course will hone the skills and behaviours required to enter the cyber security workplace. Some 1,100 places across 22 UK residential and non-residential courses are available in London, Wales, Northern Ireland, Southampton, Warwick, Cheltenham, Newcastle and Scotland. Food, accommodation and 24-hour supervision by qualified professionals, will be provided. For more information visit CyberFirst's website.